ESPN.com’s Paul Gutierrez said many of the scouts will be looking for a new job following next Thursday’s NFL Draft. Who is in the driver’s seat going into Game 6 on Sunday? Bucci Mane talked about the Golden Knights taking a 3-1 lead in the series. Chuck Powell, of 950 KJR, joins Steve Cofield & Adam Hill to discuss the news surrounding the Russell Wilson contract, Seahawks, the future NHL franchise that will be in Seattle & more on Cofield & Company. 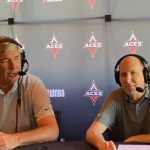 Current LA Kings Analyst/Former NHL player Daryl Evans joined Steve Cofield and Adam Hill to talk about the Golden Knights-Sharks series. The budding rivalry between the two teams, Joe Thornton and especially Ryan Reaves/Evander Kane. What does Evans think of hockey in Las Vegas? A game 4 preview and what to expect. The play by play voice of the San Jose Sharks joined Steve Cofield & Ryan McKinnell on Cofield & Company to discuss the goals for San Jose in Game 4, Martin Jones & Joe Thornton. Former UNLV guard, Kevin Kruger has returned to UNLV as part of TJ Otzelberger’s coaching staff. 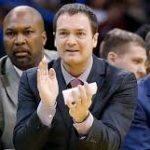 He joined TC Martin to discuss why he left his dad’s staff at Oklahoma after three seasons and the what to expect from Otzelberger and the future of UNLV basketball. The NBA columnist/SiriusXM NBA host joined Adam Candee & Adam Hill on Cofield & Company to explain how to fix the mess surrounding the Lakers right now. VGK got boat raced by San Jose 5-2 in Wednesday’s Stanley Cup Playoff’s opener.